John Fisk was one of the men who flooded into California in 1849 as part of an immense gold rush. Fisk kept a journal of his experiences and that journal has now been edited by his great-great grandson Bruce Adam. 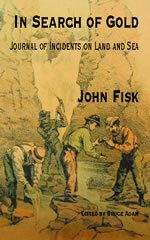 In Search of Gold: Journal of Incidents on Land and Sea reads with all the drama and excitement of a novel, but is an authentic historical narrative that is a welcome and invaluable contribution to the history of what the ’49ers experienced in reaching and working the California gold fields. Enhanced with a poem, “The Cranberry Webb Worm,” and an appendix laying out John Fisk’s lineage, In Search of Gold is a minor masterpiece of the journalist’s art and a memorable, informative, and entertaining narrative record of life in the yesteryear of California frontier history.